The IFA organised today’s protest to highlight that factories have cut cattle prices to “loss-making” levels. THE IRISH FARMERS Association have called on the Minister for Agriculture to provide additional support for the beef sector in next Tuesday’s budget. The IFA organised a protest today to highlight that factories have cut beef prices to “loss-making” levels while prices rise in the UK market. The protest brought livestock farmers from around the country to Kildare Street, along with some of their tractors. 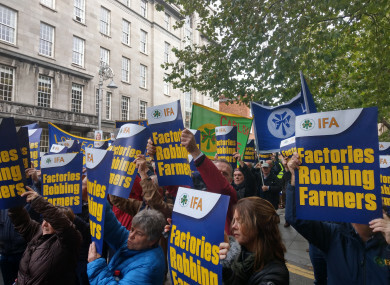 Speaking to protesters, IFA president Joe Healy said that the Minister has not lifted a finger while beef processing factories have “robbed” farmers. “You have travelled around the world to open markets, but those markets are no good if they are on the back of loss-making prices to Irish farmers. “Sort out the house at home first, get fair prices back to farmers and then get the markets,” Healy said. According to the IFA, since mid-July factories have reduced the price of beef down from a base of €4.00/kg to €3.75. Animal Health Chairman for Co Wexford Liam O’Byrne told TheJournal.ie that the Minister needs to create a level playing field for farmers. “We’re asked to produce these cattle at below cost, we need €4.40/kg to break even. “We’re down to €3.85 for cattle, we can’t work under those circumstances. The factories are creaming us off. We have to be rewarded for the work that we do. IFA Livestock Chairman Angus Woods told protestors that Minister Creed needs to be the Minister for Agriculture and not be the Minister for factories. Woods continued that income pressures on cattle farmers were at breaking point following the severe weather earlier this year but the way factories have cut prices in recent weeks is a breaking point. “Factories have torn the hell out of prices and forced them down well below the cost of production. This also eroded confidence in the marketplace and wrecked the mart price for weanlings and stores,” Woods said. South Roscommon farmer, Pat Gould told TheJournal.ie that he and other farmers feel they are “working for nothing”. “Everyone has to get a week’s wages, there are no weeks wages in farming now,” fellow farmer Mick Walsh said echoing Gould’s sentiments. Following today’s protest, a Beef Roundtable was held chaired by Minister Creed who said that “this has been a difficult year for the sector in terms of weather and the range of challenges associated with it” but that “we really need to reflect on the broad issues impacting on the sector and how best to respond”. According to a statement from the Department of Agriculture, at the roundtable Creed acknowledged the need for increased price transparency and that he has asked Bord Bia to conduct a detailed examination of market dynamics. “Having input from all sides of the agri-food supply chain, along with the Department and State agencies, in strategy formation and implementation, is crucial, whether at the Food Wise High-Level Implementation Committee or in stakeholder forums such as this one. “I hope that this engagement will continue,” Creed said. Email “'Factories have torn the hell out of prices': Farmers march on Kildare St to protest beef prices”. Feedback on “'Factories have torn the hell out of prices': Farmers march on Kildare St to protest beef prices”.